As we leave the Mexican customs and Immigration facilities at Ciudad Hidalgo, we realise we can look look forward to a couple of weeks of border crossing free travel. 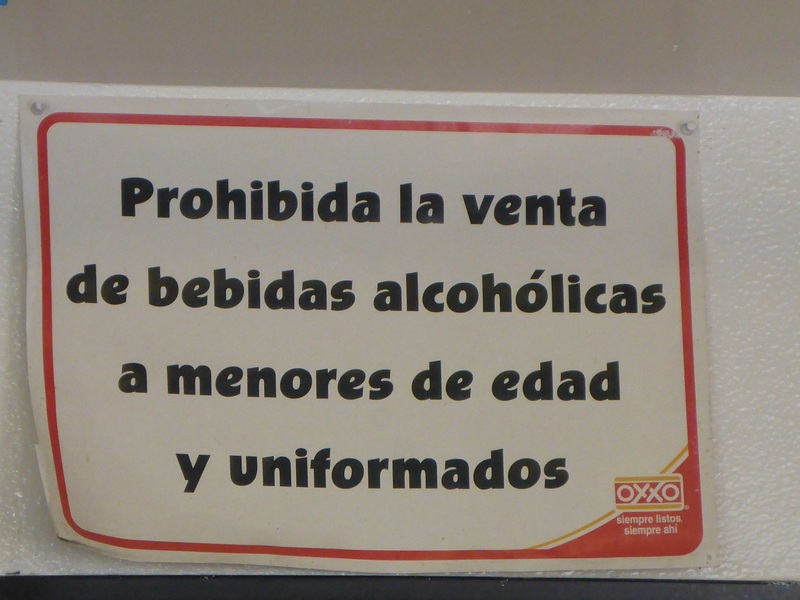 However we still have to get our Temporary Vehicle Import paperwork at Huixtla, some 80km from the border. The strange location of the Customs facilities becomes clearer when you know that the Mexican / Guatemalan border has a dozen or so official crossings and some 370 unofficial ones! The Mexican governments strategy is borders with depth. 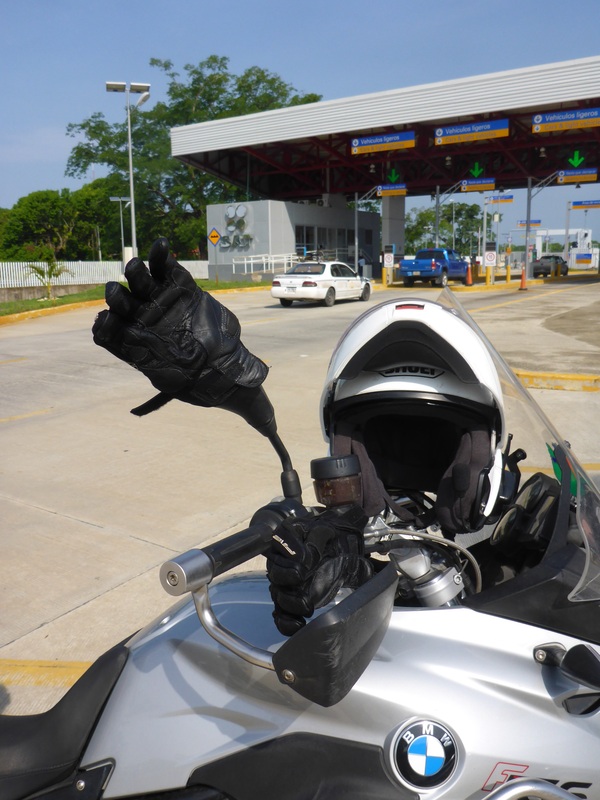 You can travel up to 25km into Mexico without additional paperwork, beyond that they have set up Customs checkpoints further inland on main routes to avoid unnecessary and expensive duplication of facilities nearer the border. A sensible strategy with such a porous border. We will tackle the paperwork the following day before we travel towards Mexico City or as it is known here just Mexico or Mexico D.F. 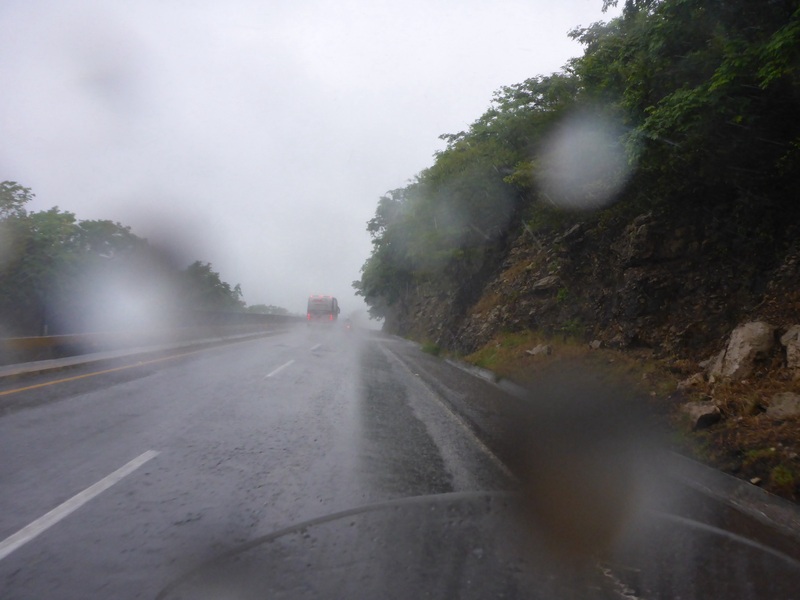 Again we enjoy the afternoon shower which leaves us well soaked and for once overnight the air-conditioning does not remove any of the water and we depart for Huixtla customs post as wet as when we arrived. Here the highway is diverted through the extensive Customs facility. Not a dirt bypass here! The morning sunshine does offer an opportunity to dry our gloves out! 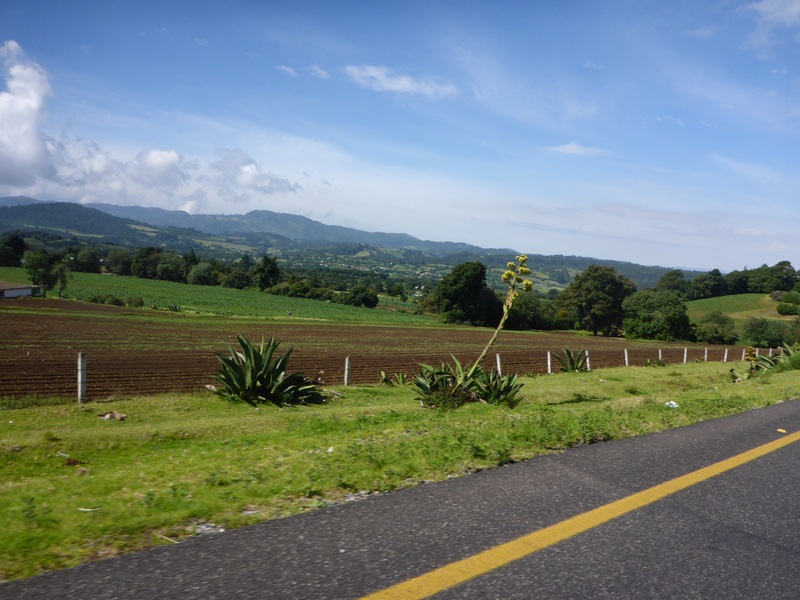 We ride westwards with the southern tip of the Sierra Madre del Sur on our right. 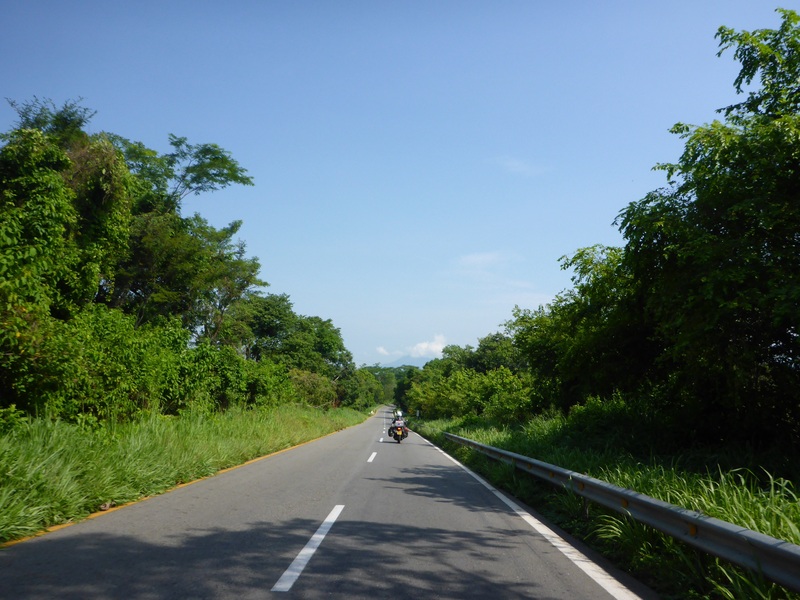 Vivid greenery runs right to the road’s edge, a mountain of work for the machete wielding workers at the roadside, although I did ponder if the high grass was left, it might provide a natural barrier in the event of accidents to slow cars and motorcycles down? Overgrown grass or safety barrier in Mexico? 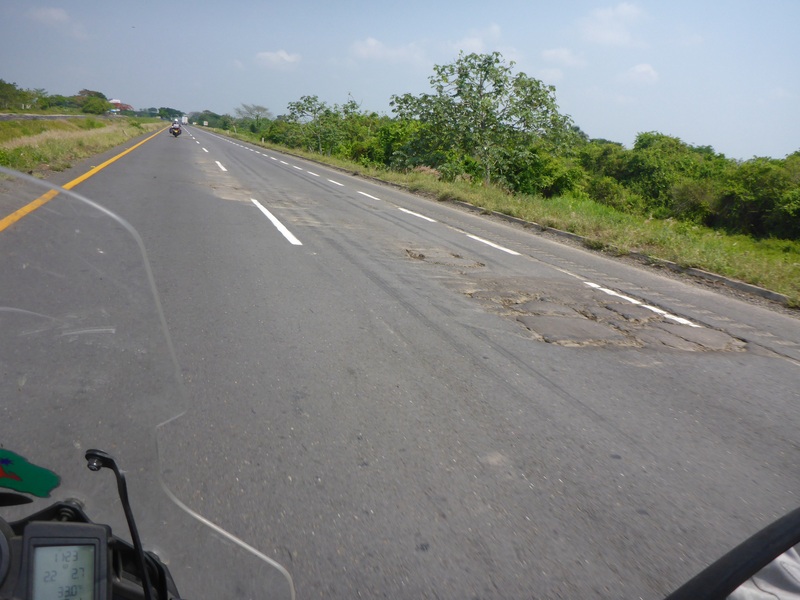 The roads are generally in reasonable condition along this stretch and we make good progress. 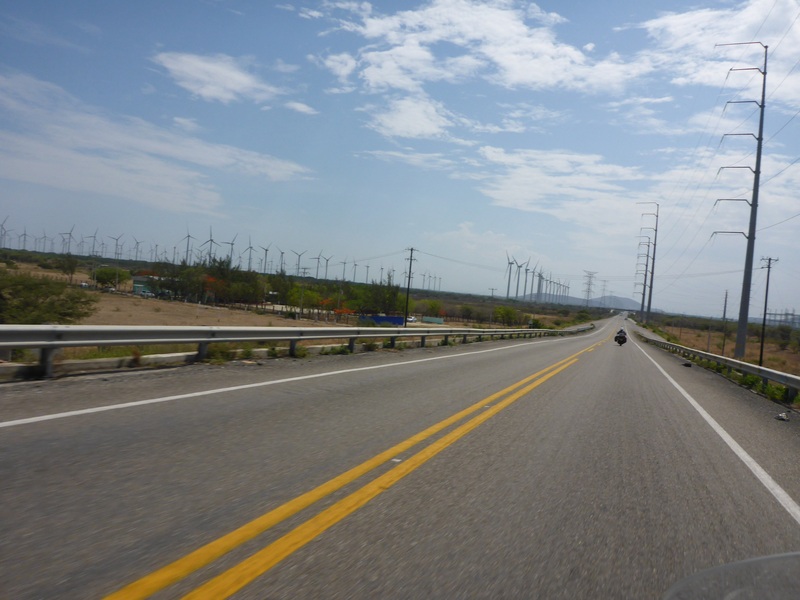 We pass vast wind farms, I count at least 5 each over 100MW each. As we have mentioned before we are seeing quite sizeable wind farm developments as we have progressed through South and Central America. It would be interesting to see how these countries’ renewable energy sources stack up against the supposedly advanced countries like ours. 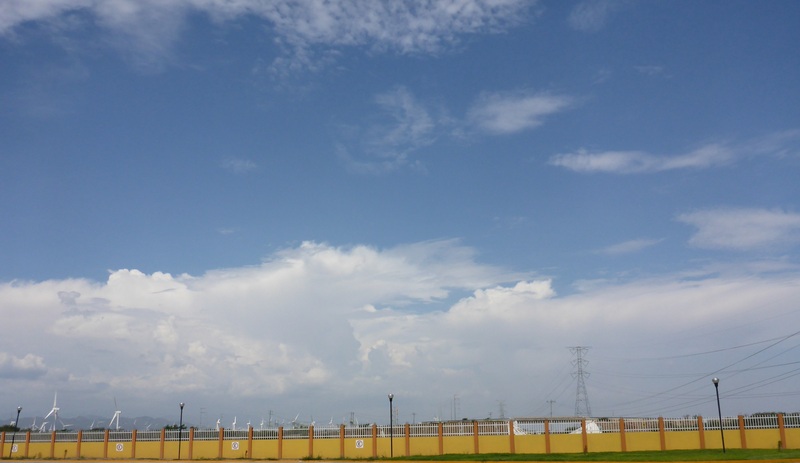 We keep a watchful eye on the clouds gathering to our right. They only seem to concern us, the truck drivers at our lunch stop seem uninterested in the weather, just a quiet siesta in the afternoon heat. 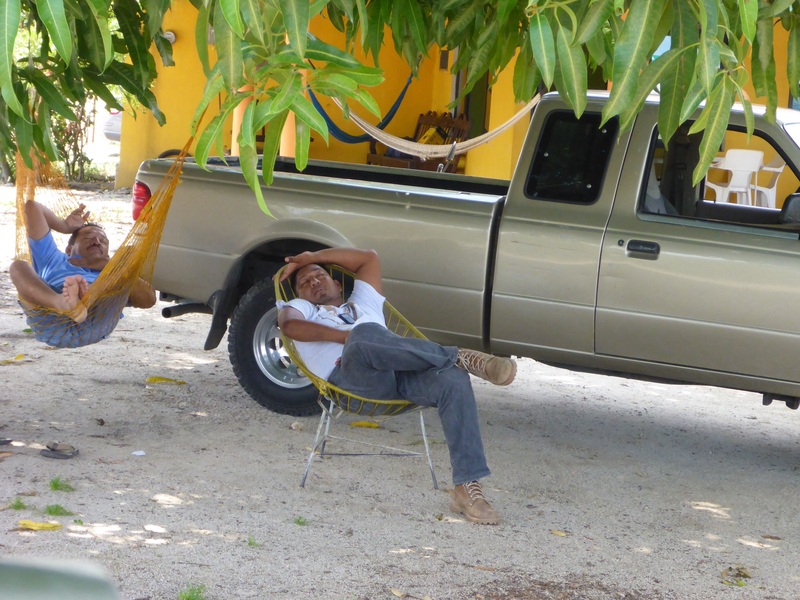 We had seen hammocks for sale in many places that only locals would frequent, but had not seen them in action before. Matías Romero Avendaño provides an overnight stop. Storm clouds gather but for the first time in a week we arrive before the heavens open up. Our first dry day and we are moving out of malaria territory. Tomorrow we will reach the coast and take a couple days’ R&R before we progress to Mexico City. 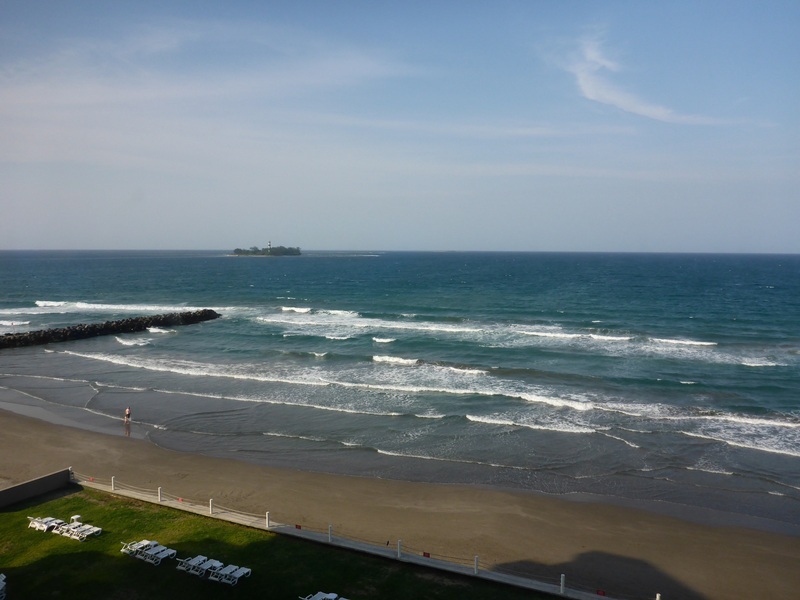 Our beachside destination is Boca del Rio, just outside Veracruz on the Mexican Caribbean coast. 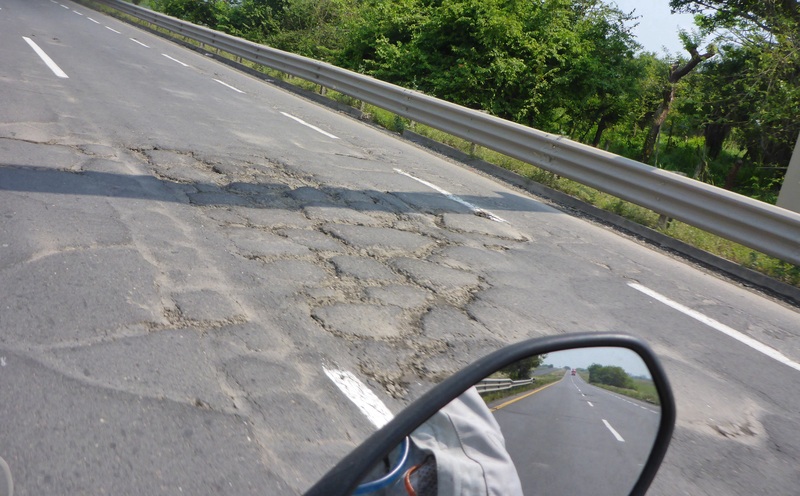 A four lane toll road provides a fast route to the coast, we note however the damaged road surface and while, for the first time in weeks, the speed limit is a seductive 110 km per hour, large potholes and crevasses in the concrete sections make for more dangerous riding and require keen observation to avoid most of the obstacles. Boca del Rio is just what we needed, although the expected washing machine advertised on the website does not eventuate and the wet dog smell will persist till Mexico City. We realise that evening that we have reached probably our lowest energy point on the trip. We both find it difficult to communicate clearly and misunderstand what we are saying to each other. We decide that night we will spend a second night here. We are not ready to travel on. Beach, swimming and relaxing are the order of the day. 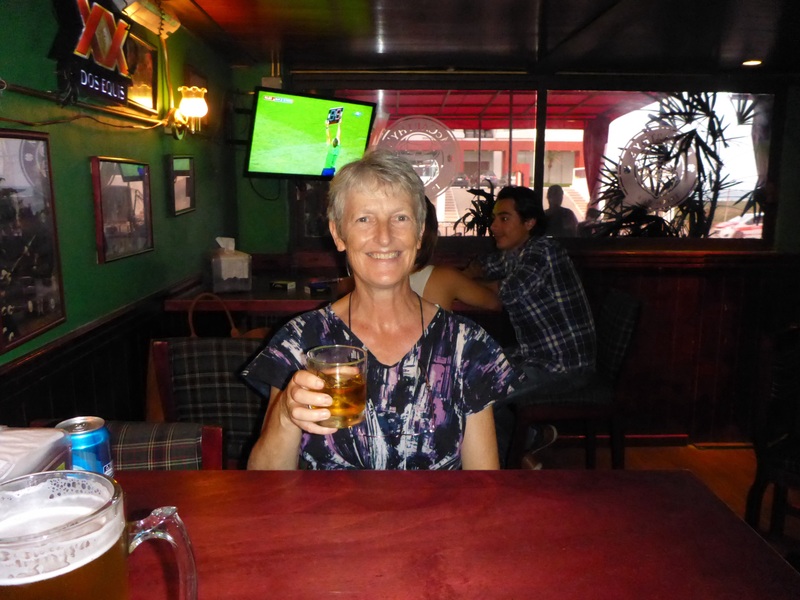 Our evenings are spent at the nearby Irish pub, eating spicy Mexican/Irish food, listening to rock music and chatting with a couple of local motorcycle riders. 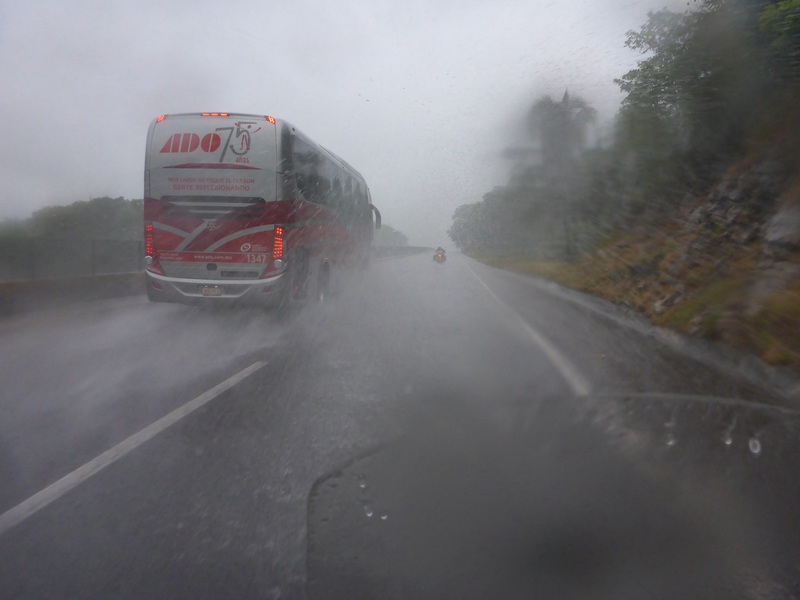 Our ride to Mexico City starts with an unexpected rain storm. 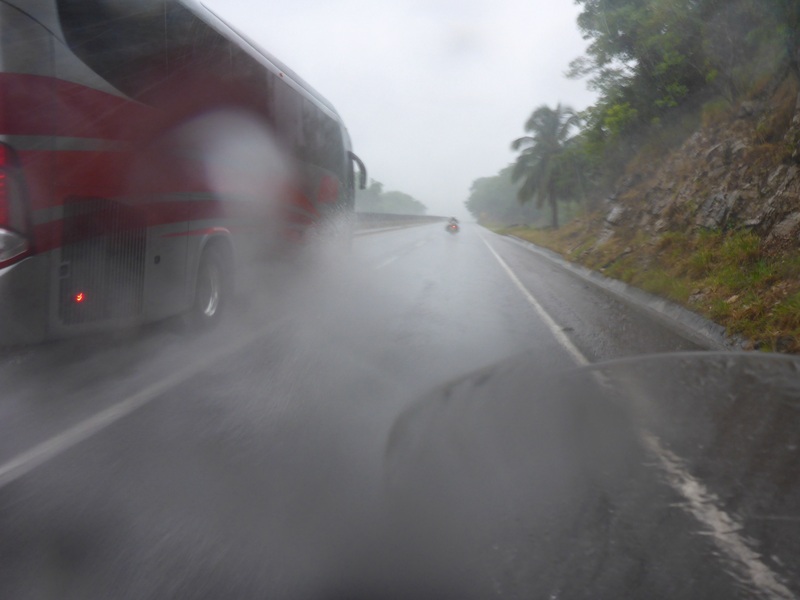 The deluge leaves us travelling slowly trying to avoid the sheets of water that the buses and trucks generate, mostly unsuccessfully. Our persistence is rewarded, the sun returns and we can look forward to climbing from sea level to over 3,000 meters to cross the Sierra Madre Oriental. 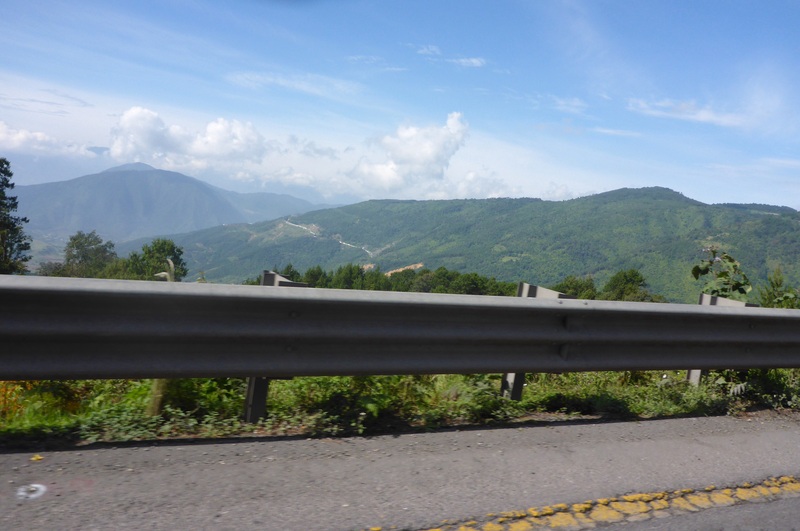 The climb near Maltrata is spectacular, two lanes in each direction that take completely different routes with little traffic almost makes you want to ride down and do it again except the temperature has dropped from 30 to 13 degrees celsius! 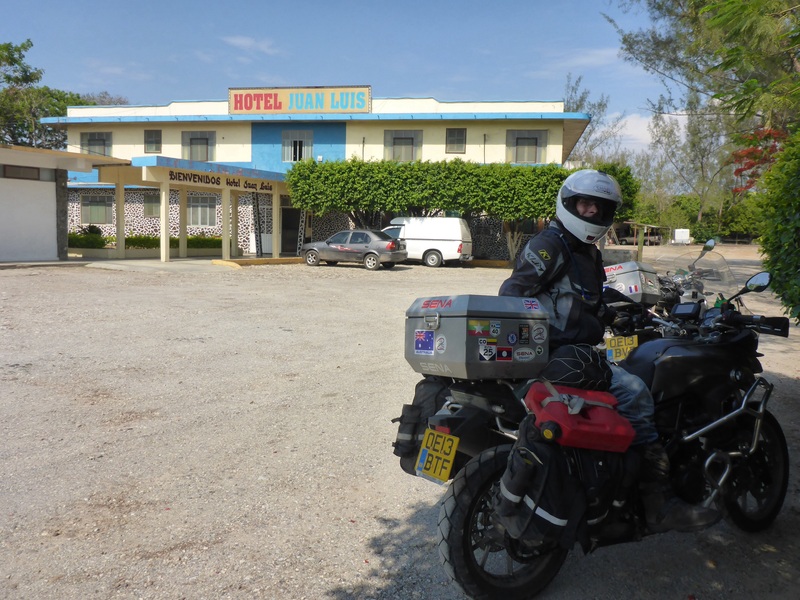 Around this point we pass 35,000 km or 22,000 miles on this trip. What will our final mileage be, I estimate between 42,000 and 45,000 km. When we reach the USA I should put a poll up as to what you the reader estimate we will do to reach Montreal in early September. We are staying with our friends, Anna and Alberto and their two daughters. They live on the western side of Mexico City, population estimated to be around 20 million and as we arrive from the east, a fun crossing awaits. In cities we have used taxis and especially since my GPS map stops short of the city so we get into the centre and hire a taxi to follow. Given the style of driving here to avoid losing the taxi, one needs to sit about half a meter off his bumper to avoid being squeezed out by other drivers. Wish I had the skill of a Formula 1 driver that can do that easily. 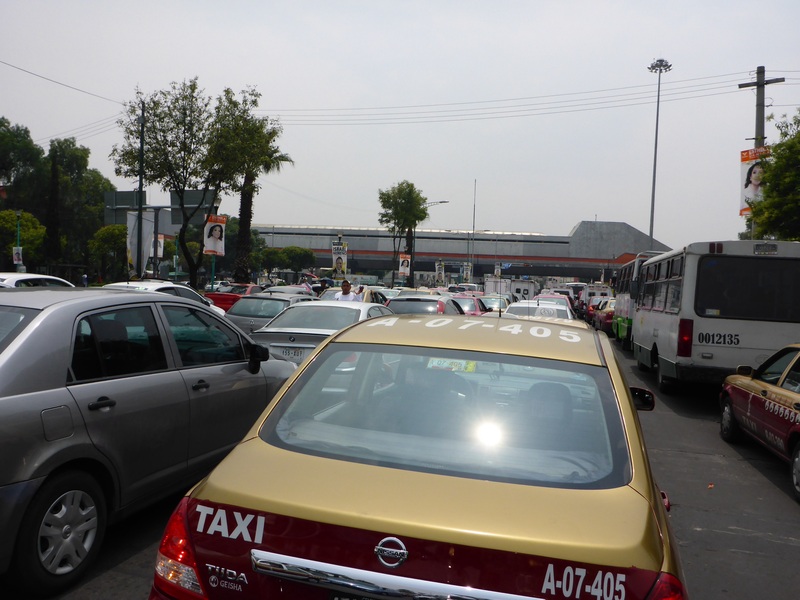 It takes us 3 hours to cross Mexico City. As we approach our destination Anne can hear an unusual sound from the front wheel. We decide a visit to BMW is in order to check this out. On arrival at BMW, Anne then discovers a dented wheel rim! Anne and I recall a particularly bad pothole Anne hit on the highway, probably while avoiding other potholes or it could have happened this morning as she didn’t have time to see the coverless manhole before riding over it. We will now be staying 10 days not the 5 we had planned. Anna and Alberto are kind enough to extend their hospitality for another five days. We will get to see more of them and Mexico City than we had planned and enjoy relaxing in their lovely home. Lucky Anne did not come off in the encounter with the manhole! Must have been a big whack to bend the rim! Excellent riding to stay on!!!! You seem to have the knock of bringing rain with you now, any thoughts of doing a ride through California as they look like the need the water, may be get paid for the effort. Very lucky, but she is a skilled rider. We are trying to avoid rain, we are not like the lorry driver in the ‘Hitchhikers guide to the Galaxy’ who was a minor rain god and rain followed him wherever he went. We have had very little overall so California will have to find new saviours. Just read the Mexico blog, you must have been tired half way through that, not surprising. Thanks for keeping me in mind, I have some interesting discussions going but would live to do a US trip. Take care, enjoy the extra 5 days in Mexico City and stay safe! Been great to stay here for over a week, relax and catch up with the blog. Annes bike fixed and we will be on our way on Sunday. Should be in Texas on Tuesday. Probably was, great to have a place to unwind. Done a little sightseeing and just enjoyed the centre of town which was much greener than we expected. Only a couple of borders to cross and a more leisurely pace, we hope, in the coming couple of months. Agreed that someone watches over us, maybe they needed a break as well. We have enjoyed our time here, but looking forward to being back on the road on Sunday. Traffic is not to bad! 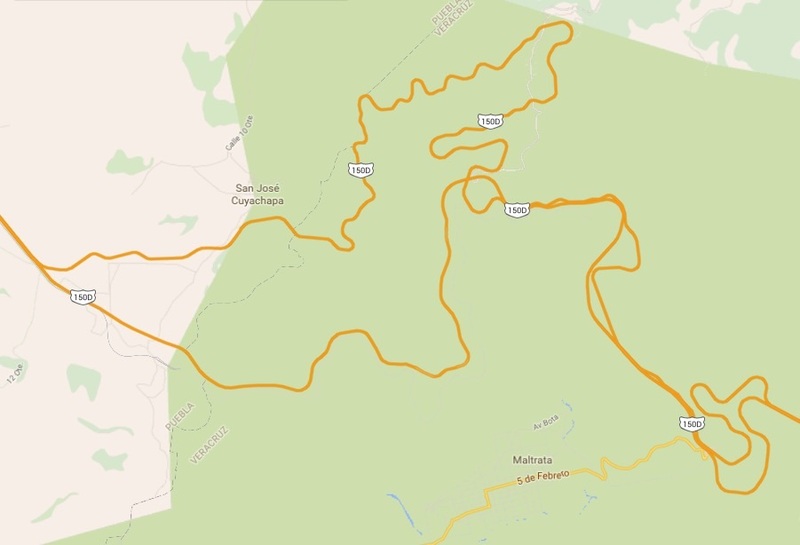 Must be a reflection of some of the other places we have ridden. Oh and how we would love to ride in Botswana one day too. Haven’t been since we hitched through Africa in 1982!! 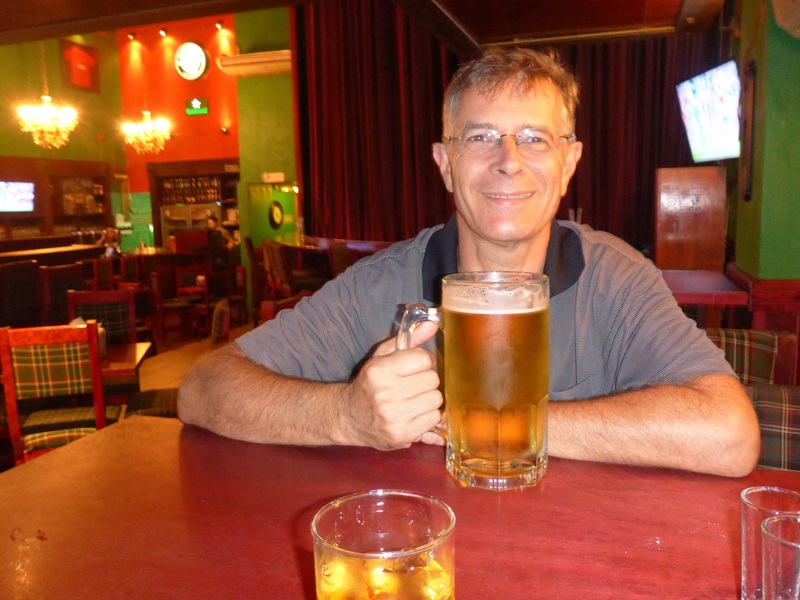 Fab blog – thks for contacting us! Safe and happy riding!! !